"Performapal", known as "Entermate" (ＥＭ（エンタメイト） Entameito) in the OCG and the English One-Shot Chapter and as "Enter-Mate" in the English Yu-Gi-Oh! ARC-V manga, is an archetype used by Yuya and Yusho Sakaki in the Yu-Gi-Oh! ARC-V anime and manga. The archetype is primarily designed around circus animals, donning apparel such as top hats and polka dot bow ties. Yuya uses the archetype's diversity in appearance to traverse around the Duel Fields, using "Whip Snake" to scale high buildings and "Skeeter Skimmer" to travel across water. Many of the members of this archetype have a colored star on their bodies, as well as some of them having nearly the same background with stars and circles but different colors. Both the English and Japanese names are simple portmanteaus: "Performapal" is a portmanteau of "performance" and "pal", while "Entermate" is a portmanteau of "entertainment" and "mate". 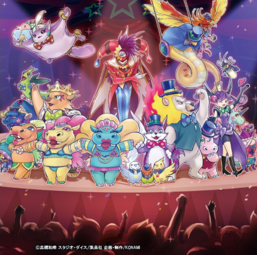 The "Performapal" archetype members tend to have their names formed of portmanteaus, usually of a description of what purpose they serve or what they are based off of, plus what animal/circus entertainer they are. For example, the Japanese name for "Performapal Hip Hippo" is "Discover Hippo", which reflects how it is Yuya's main mode of transportation during Action Duels to find Action Cards. Another example is "Sword Fish", which is based off a sword-shaped fish. Ballad Ballad Rose + Ballad A portmanteau of the Japanese word for "rose" (薔薇 Bara) and "ballad". Barracuda Barracuda Rose + Barracuda A portmanteau of the Japanese word for "rose" (薔薇 Bara) and "barracuda". Bit Bite Turtle Big Bite Turtle Bit/Big + Bite + Turtle Has a Pendulum Effect that "bites" off one bit of a monster's Level. Bot-Eyes Lizard Bot-Eyes Lizard Bots + Eyes + Lizard Has eyes made of mechanic parts, possibly a pun on "Odd-Eyes" - what this card can transform into. Bowhopper Gunhopper Crossbow + Grasshopper Has a crossbow-shaped body propelling a cricket. Bubblebowwow Bubbulldog Bubble + Bow Wow/Bulldog Releases bubbles upon using its effect. Camelump Cameldown Camel + Lump/Down Lowers the DEF of an opponent's monster. Changeraffe Chain Giraffe Chain + Giraffe Has an effect to "chain" an opponent's monster down, preventing it from attacking. Cheermole Cheermole Cheerleading + Mole Is dressed up as a cheerleader where she boosts the difference between original and current ATK. Coin Dragon Drago Remora Drago + Remora/Coin + Dragon English name refers to the koban coin on its forehead. Corn Corn Corn Combos with "Performapal Uni", with which it forms the word "Unicorn". Dag Daggerman Dag Daggerman Dag + Dagger + Man Resembles Yusho Sakaki. Dropgallop Drop Gallop Drop + Gallop Can lower its Level below 5. Drummerilla Drumming Kong Drum + Gorilla Has a pair of drums for pecs. Duck Dealer Duck Dealer Duck + Dealer Has an effect that deals you one card. Elephammer Hammer Mammo Elephant/Mammoth + Hammer Has a hammer on the end of its trunk. Extra Slinger Extra Shooter Extra + Sling/Shooter Uses bows and arrows for its Pendulum Effect, based on the number of face-up Pendulum Monsters in the Extra Deck. Fire Mufferlion Fire Mufflio Fire + Muffler + Lion Has a muffler made of fire. Fireflux Fireflux Firefly + Lux Has a light bulb for a thorax. Flat Rat Flat Rat Flat + Rat Is standing on a rolling pin, which either flattens out the Levels of all monsters to this card's Level or can flatten a monster's changed ATK to its original ATK. Flip Hippo Allcover Hippo Flip/All + Discovery + Hippopotamus Has an effect that flips monsters to Defense Position. Friendonkey Friendonkey Friend + Donkey Possesses the ability to Special Summon other "Performapals" with the pack on its side. Gatlinghoul Gatling Ghoul Gatling gun + Ghoul Wields a gatling gun. Gold Fang Gold Fang Gold + Fang Has a set of fangs made of gold. Gongato Gongcat Gong + Gato Has a gong-shaped body. Guitartle Guiturtle Guitar + Turtle Has a guitar-shaped body. Gumgumouton Rubber Mutton Gum/Rubber + Mutton Has a body made entirely of rubber. Handsamuraiger Handsome Liger Handsome + Liger A portmanteau of "handsome" (ハンサム Hansamu) and "liger" (ライガー Raigā), which also forms the word "Samurai" (サムライ Samurai). Handstandaccoon Return Tantan Handstand/Return + Raccoon Is standing on its hand with an effect that returns a card to the hand. Helpprincess Helpprincess Help + Princess Is holding a telephone in her right hand to provide long-distance assistance. Hip Hippo Discover Hippo Hip/Discovery + Hippopotamus English: Is hip to the whereabouts of Action Cards. Japanese: Can discover hidden Action Cards. Kaleidoscorp Kaleido Scorpion Kaleidoscope + Scorpion Has an effect that is visualized as a light show. King Bear King Bear Monarch (synonym of King) + Bear Wears a crown, which is a symbol of a king. Lebellman Le-Bellman Level + Bellman Has a bell cap on its head. Life Swordsman Life Swordsman Life + Swordsman Has an effect related to LP. Lizardraw Lizardraw Lizard + Draw Possesses the ability to draw cards. Longphone Bull Longphone Bull Longhorn + Phone + Bull Has a phone on top of his head, which he can use to call his friends for help. The term "long" could be considered him calling his friends who are far away. In this case, the deck. Miracle Mirrorabbit Miracle Mirrorabbit Miracle + Mirror + Rabbit Has an effect to "reflect" the targeting effect to this card. Momoncarpet Momoncarpet Momonga + Carpet Has a carpet-shaped body. Monkeyboard Monkeyboard Monkey + Keyboard Has teeth that resemble a keyboard. Nightmare Knight Nightmare Knight Nightmare + Knight Has an effect that can inflict a nightmarish 1000 points of damage. Odd-Eyes Dissolver Odd-Eyes Dissolver Odd-Eyes + Dissolution Has heterochromia iridium, similar to the "Odd-Eyes" monsters. Odd-Eyes Light Phoenix Odd-Eyes Light Phoenix Odd-Eyes + Light + Phoenix Has heterochromia iridium, similar to the "Odd-Eyes" monsters. Odd-Eyes Metal Claw Odd-Eyes Metal Claw Odd-Eyes + Metal + Claw A fusion of "Odd-Eyes Pendulum Dragon" and "Performapal Silver Claw". Odd-Eyes Minotaur Odd-Eyes Minotaur Odd-Eyes + Minotaur Has heterochromia iridium, similar to the "Odd-Eyes" monsters. Odd-Eyes Seer Odd-Eyes Priest Odd-Eyes + Priest/Seer Has heterochromia iridium, similar to the "Odd-Eyes" monsters. Odd-Eyes Synchron Odd-Eyes Synchron Odd-Eyes + Synchron Has heterochromia iridium, similar to the "Odd-Eyes" monsters. Odd-Eyes Unicorn Odd-Eyes Unicorn Odd-Eyes + Unicorn Has heterochromia iridium, similar to the "Odd-Eyes" monsters. Partnaga Partnaga Partner + Nāga Possesses the ability to power up/protect other monsters. Pendulum Sorcerer Pendulum Magician Pendulum + Sorcerer/Magician Is holding an item resembling Yuya's pendant. Pyro Lobster Pyro Lobster Pyro + Lobster Equipped with jet boosters. Radish Horse Radish Horse Radish + Horse Has a body and horn that both resemble a radish. Rain Goat Raingoat Raincoat + Goat Possesses the ability to either reduce Effect damage or protect "Performapal" and "Odd-Eyes" cards, which is visualized as putting on a raincoat. Salutiger Warrior Tiger Salute/Warrior + Tiger Wears a military-like uniform while saluting. Seal Eel Seal Eel Seal + Eel Has effects that can "seal" the activation of an opponent's card. Secondonkey Secondonkey Second + Donkey Is the second donkey "Performapal". Possesses the ability to be Special Summoned after another "Performapal". Shieldrummer Shieldrummer Shield + Drum Has a drum-shaped lower torso. Silver Claw Silver Claw Silver + Claw Has a pair of huge metallic claws on its front paws. Skeeter Skimmer Amenboat Slang for Mosquito + Skimboarding Has a body mainly comprised of a boat, which is useful for aquatic transportation in an Action Duel. Spikeagle Spike Eagle Spike + Eagle Possesses the ability to give monsters Piercing Battle damage. Splashmammoth Mammoth Splash Splash + Mammoth Forms bubbles upon using its effect. Springoose Springoose Spring + Goose Has a spring-shaped lower torso. Stamp Turtle Plusturtle Stamp/Plus + Turtle Is holding a stamp in its hand. Swincobra Swing Cobra Swing + Cobra Is attached to a swing by its midsection. Sword Fish Sword Fish Sword + Fish Has a sword-shaped body. Teeter Totter Hopper Seesawhopper Seesaw (synonym of Teeter Totter) + Grasshopper Has a seesaw-shaped body. Possesses the ability to bring back cards and itself, hence the notion of going up (Field/Hand) and down (Graveyard). Thunderhino Thunderhino Thunder + Rhinoceros Has a motif based on lightning. Trampolynx Trampolynx Trampoline + Lynx Has a trampoline-shaped torso and possesses the ability to "bounce" monsters to the hand. Trumpanda La Panda Trumpet/La musical note + Panda Refers to its musical design. Trump Witch Trump Witch Trump + Witch Reference to it giving Yuya the ability to Fusion Summon. "Trump" could also be translated as "tramp", referring to its patched clothing. Releases card suits when using its Pendulum Effect. Turn Toad Turn Toad Turn + Toad Possesses the ability to swap a monster's ATK and DEF. Has body markings that resemble a face which can be seen on its bottom. U Go Golem Fugolem Fusion + Golem Has a "U"-shaped body, along with the card's English name as a pun to the Japanese word meaning "fusion". Uni Uni Uni Combos with "Performapal Corn", with which it forms the word "Unicorn". Whip Snake Whip Viper Whip + Snake Has an effect that is visualized by hypnotizing the enemy. Can be used as a whip in an Action Duel. "Performapal" monsters possess varied effects giving the archetype a lot of versatility. Many of the weaker monsters possess strong effects that work well when used together. Monsters like "Cheermole" and "Sword Fish" can manipulate ATK and DEF permanently in large increments and continue to do so if they can remain on the field while others like "Fire Mufflerlion" and "Spikeagle" grant bonuses for attacking by providing a second attack for one of your monsters and piercing damage respectively. As the first Pendulum Monster archetype, "Performapal" features a large number of Pendulum Monsters designed to make the most out of the Pendulum Zones. "Silver Claw" is a powerful beater in the Monster Card Zone that boosts all "Performapal" monsters' ATK when in the Pendulum Zone. "Pendulum Sorcerer" boosts all "Performapal" monster's ATK by 1000 during a turn when the player Pendulum Summons. "Skullcrobat Joker" and "Odd-Eyes Unicorn" offers the highest Pendulum Scale of the archetype (8), with the effect of "Skullcrobat Joker" allowing to add a "Performapal" monster, a "Magician" Pendulum Monster, or an "Odd-Eyes" monster from the Deck to the hand with its effect, while "Odd-Eyes Unicorn" gives a boost in ATK to a selected target with its Pendulum Effect and helps recover LP with its normal effect. "Performapals" can lack pushing power on their own, especially when used as a Rank 4 Monster engine, and can used alongside the "Dracoslayer", "Magician", and other Pendulum archetypes to even out Special Summoning, with "Lizardraw" and "Guitartle" as the draw combo "Monkeyboard" and "Skullcrobat Joker" can search for "Partnaga" for ATK and "Turn Toad" can weaken opposing monsters. "Wavering Eyes" or "Pendulum Sorcerer" can clear the Pendulum Scales for the next round of effects the following turn. The archetype is also highly capable at searching and drawing its members out of the Deck through multiple cards. Of these, "Pendulum Sorcerer" is the most potent as it can search for two "Performapal" monsters every turn, and due to its ability to target itself with its destruction effect, can send itself to the Extra Deck to be Pendulum Summoned later. Combining it with effects like "Supply Squad" and "Lizardraw" allow you to gain card advantage quickly, and using "Friendonkey" is an easy way to initially Special Summon it from the hand. "Secondonkey" provides the archetype with another avenue to search out its cards, sending a "Performapal" monster from your Deck to your Graveyard for later revival via "Friendonkey", or if both your Pendulum Zones are occupied, letting you add the searched "Performapal" monster to your hand instead. On its own, the archetype is capable of quickly swarming the field and gain large ATK boosts through their Pendulum Monsters' effects. "Performapal Pendulum Sorcerer" and "Partnaga" can greatly boost the ATK of one or all "Performapal" monsters until the end of the turn. As such, it's relatively easy to come into the Battle Phase with at least 1 monster with over 2500 ATK. The strongest monster in the "Performapal" archetype is "Elephammer" at 2600 ATK, which can be Normal Summoned without tribute if the player controls two or more other "Performapals", and bounces all of the opponent's Spell and Trap Cards when it attacks. Together with the swarm capabilities afforded by Pendulum Summons, "Elephammer" can make a good finisher for the archetype. With the release of Structure Deck: Master of Pendulum and Shining Victories, the "Performapal" archetype has become more intimately entwined with the "Odd-Eyes" and "Magician" archetypes through cards like "Performapal Skullcrobat Joker", "Sky Iris", and "Performapal Odd-Eyes Unicorn", which gives the Deck more efficient use of outside cards that were previously just splashable–especially "Odd-Eyes Pendulum Dragon". Though many of the Level 2 and 3 "Performapals" possess strong effects, the only "Performapal" monsters with a Scale of 1 are "Performapal Monkeyboard" (which is Forbidden in the TCG and OCG) and "Performapal Gumgumouton", making it very difficult to retrieve those Level 2 Pendulum Monsters from the Extra Deck without relying on Pendulum Monsters from outside the archetype. While "Performapals" are outstanding in manipulating ATK and granting special combat tricks to Pendulum Monsters during the Battle Phase, they suffer a debilitating lack of power under most circumstances. Outside of your own Battle Phase, "Performapals" lose most of the ATK bonuses they gain and are left stranded with their very low original ATK (with the exception of the outstanding 2600 ATK of "Performapal Elephammer", most barely scrape over 1800 for ATK or DEF). Combined with the issue of getting support monsters out consistently, dedicated "Performapal" Decks will often be left with a field with a few low ATK monsters if you don't have protection such as "Last Minute Cancel" on hand. On top of all of this, "Performapal" cards in general (Monster, Spell, and Trap) have a near-random assortment of effects which make building a Deck around them convoluted or predictable. As "Performapal" Decks greatly rely on their capacity to Pendulum Summon and their Spell and Trap Cards to maintain advantage, "Anti-Spell Fragrance" is especially debilitating to the Deck, preventing any Pendulum Scales from being placed and forcing at least one turn of waiting before any Spell Cards can be activated. "Magic Deflector" and "Spell Canceller" negate most Spell Effects all together. "Blue-Eyes Spirit Dragon" also hinders this deck greatly when it comes to Pendulum Summoning, as it prevents each player from Summoning more than once monster at the same time. With its 3000 DEF, a "Performapal" will likely not win a battle against it. "Spirit Dragon" can also negate the activation of Graveyard effects "Performapal" monsters may have. Paired with its ability to dodge being targeted or destroyed by opposing effects by replacing itself with "Azure-Eyes Silver Dragon", "Spirit Dragon" is probably one of the most troublesome cards for "Performapal", and Pendulum Decks as a whole, to deal with. The following Decklists may contain copies of cards that exceed the maximum amount allowed by the current Forbidden & Limited List. These should not be changed, as these Decklists are copied verbatim at the time they were published. Shueisha's VE11 Deck: Entertainment Carnival! This archetype has the second-highest Type diversity, with members belonging to 14 of the 25 Types: Aqua, Beast, Beast-Warrior, Dragon, Fairy, Fiend, Fish, Insect, Plant, Reptile, Rock, Spellcaster, Warrior, and Winged Beast. It is beat out only by the "Number" archetype at 19.